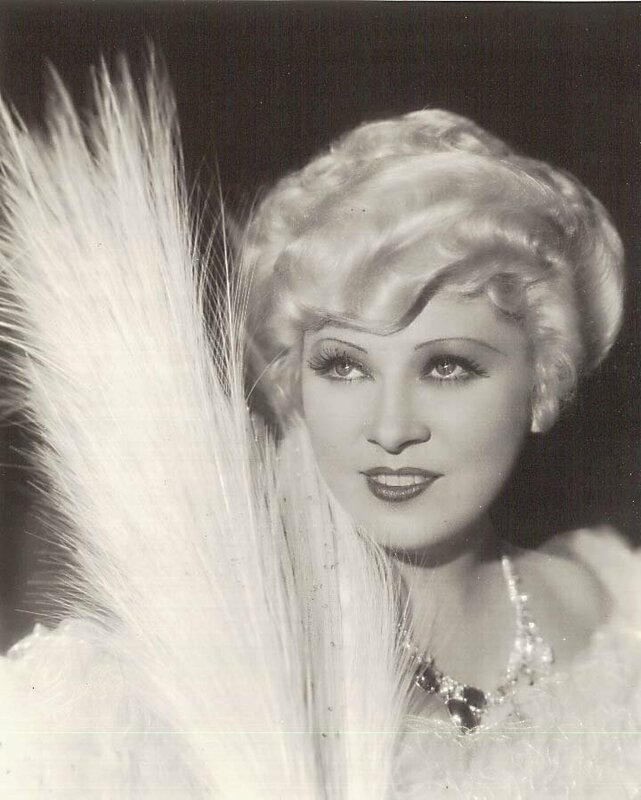 Mae West was still plenty hot stuff in the sixties, riding the crest of new-found popularity among the "protest" youth crowd that would also embrace W.C.Fields, Humphrey Bogart, and The Marx Brothers. She was fashionably anti-establishment because she made saucy movies back in the thirties and still wielded a nasty tongue in her dotage, a thing borne out by her embarrassing turns in 1969’s Myra Breckingridge and the later, even more execrable, Sextette. I used to see her as a kid on Channel 8 in Belle Of The Nineties, the one Mae West title they owned, and alas, the first of her vehicles to be hollowed out by Code enforcement. Mae’s comeback during the Age Of Acquarious seems to have shared its emergence with that of the Motion Picture Ratings System, which finally and for all time wiped out the Code. Up until then, her early pictures still packed a wallop in terms of raunchy content, though it would be only a few years before "Now Generation" fans would move on to the next fad. Thirty-five years later, we’re left with a rather odd feminine screen presence that seems not of this earth --- or at least not the earth we occupy today. Were there ever women like Mae West? I mean, even in the Gay Nineties, inevitable setting for virtually all her movies? Maybe the real-life Jenny Lind or Maud Adams were like this --- Sarah Bernhardt in her youth perhaps? West must have seemed peculiar even during the peak, albeit wildly popular. That generous, if corpulent, figure adhered to conventions of an earlier day (the gay nineties again), not to mention studied theatrical posing in costumes that must have weighed sixty pounds in the box. 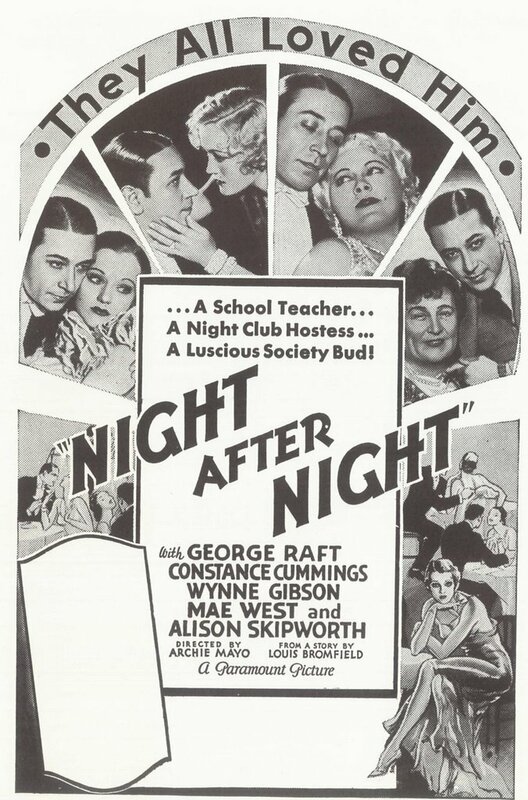 I was reminded of this unspooling Universal's DVD of Night After Night, Mae’s 1932 motion picture debut. This isn't much of a movie, but it may well be the best thing she did, and for all that, it’s worth a closer look. 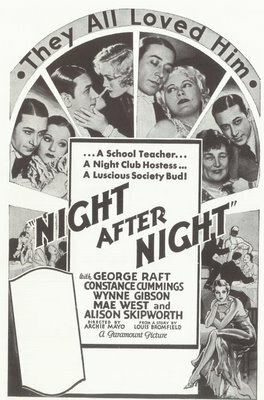 Night After Night was intended to launch George Raft as a leading man. 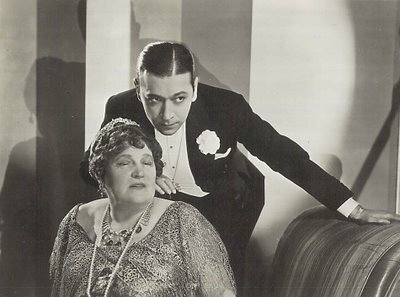 He’d played in support of Paul Muni in Scarface, doing a coin-flip routine that became grist for impression and caricature thereafter (WB would even resurrect it ten years later when they spoofed Raft in Tex Avery’s cartoon, Hollywood Steps Out). Truth to tell, George didn’t have a lot to give beyond the coin gag, but flipped gals in the audience who went for his swarthy appeal in a large way. In Night After Night, he’s among half-hearted denizens of the underworld that studios were forced to soften up in response to public outcry over hard-edged gangster stuff of Little Caesar, The Public Enemy, and George’s own Scarface. Cagney, Robinson, and now Raft were obliged to play it for either comedy or sentiment. Thus we had The Little Giant, Hard To Handle, and Night After Night, among many others. The latter seems slow at just 70 minutes, and you could run a Studebaker on oil in this man's hair. Just at halfway point, when it looks like time to bail, comes Mae West, and she’s just dynamite. I’d not seen this show since it was on a Tennessee channel back in 1970, so it came as a shock to realize just how good West could be with hair let down, something that wouldn't happen again once starring roles gathered more light ... and scrutiny. Here Mae’s relaxed and seems to enjoy interplay with others. There's not that aloof quality she displayed later on. Two outstanding scenes highlight Night After Night, and word is the actress took over dialogue she'd deliver upon disapproval of Paramount's script. For a whole second half of Night After Night, you keep waiting for her to come back. It was likely as not the same way for folks in 1932. Based on their fantastic response, Mae’s graduation to leads was swift and foregone. I’d have been happier with the Carole Lombard set if they’d stayed with earlier output. 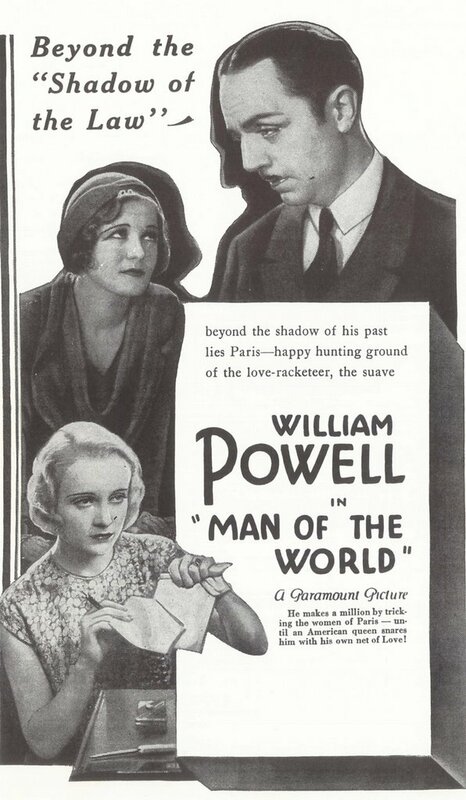 A combo of White Woman, Sinners In The Sun, Supernatural, and No Man Of Her Own would have been sweet, but in this DVD business, we must settle for crumbs we get, which in this case is Man Of The World, the lone precode amongst a brace of mid-thirties Lombard comedies. The titular figure is deathless Bill Powell, here magnificent. They were married the year this was done --- she called him "Philo," after a sleuth character he’d played --- but a split followed as Bill really wasn’t engaged by night-life scenes (when you’re the coolest sport in town, you needn't go out of the house to prove it). Man Of The World starts like gangbusters. Bill’s got a smooth line in blackmail you’d pay off just to hear his spiel. A scene with Guy Kibbee in the first reel is what renders certain 30's moments priceless. In fact, there’s much fun to be had … until a regrettable payoff … and there’s the letdown. So as to avoid spoilering, I’ll merely recite the cardinal rule for Bill Powell vehicles ... he must triumph. We want Powell to walk away with the woman, whatever money's at stake, his rival’s dignity --- everything. Defeat is not an unacceptable option, and there’s the reason I just can't abide (at least the finish of) Man Of The World. To be preferred is Lawyer Man, Private Detective 62, and especially The Road To Singapore (what a delicious ending here!). It seems all of Bill’s Paramount vehicles had bummer wraps, as though Paramount anticipated Code enforcement and was rushing to meet it. Plus they still thought of Powell as a heavy, his identification from silent days. The actor certainly rolled up a gallery of sleazy characterizations while there. The difference, and it’s a crucial one, between a Paramount Powell and a Warners Powell, is that he could misbehave at WB and thrive for it, which is only how we prefer enjoying him today. I do concur with your observation on West's relaxed, funny and surprisingly engaging performance in NIGHT AFTER NIGHT. There's a human dimension to her acting here that just isn't found in her later films -- all of which were vehicles for her more imposing (and awfully impressive) traditional screen persona. As West's life-long association with that character was probably at the heart of her success, I don't take strong issue with her sticking so closely to it; but there's a suggestion in NIGHT AFTER NIGHT that she could have well played -- and enlivened -- a number of roles in pictures that weren't strictly "Mae West" movies. 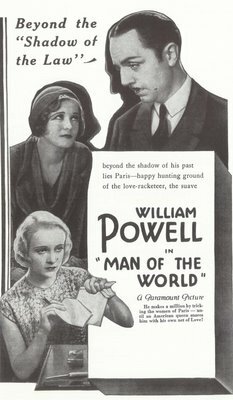 Any chance to read more about William Powell in the future? He fascinates me. Anything more on William Powell is welcome. He was an amazing man. From his poor, starving student/artist days in a dump of an attic room in the 1910s NYC, where he met and hung around with other young men destined to be great, to his retirement that was as dignified as he was. He went out on top and never came out of retirement, as a lot did, to do something embarrassing. In between NYC and retirement, he had an amazing career and life. He really was a character, he had such a kooky sense of humor. In the 20s his antics were noted a lot. He's one of the few stars that you'd be hard pressed to find a negative word about. He really seemed revered. I've seen so many touching comments about him. He showed great kindness to younger actors and actresses. Gary Cooper and Jimmy Stewart acknowledged his helpfulness, James Cagney was enthralled by his stories of stage days, Joseph Cotten said while not a social butterfly, he was always the most interesting person at gatherings, Rosalind Russell spoke very touchingly of his sweetness and kindness, and even Marilyn Monroe said that perhaps the kindest compliment she ever received was from none other than William Powell. Of course, Myrna Loy had many great things to say about him. They were something that will never be seen on screen again. They had one of the most beautiful Hollywood friendships ever. Fifty years.